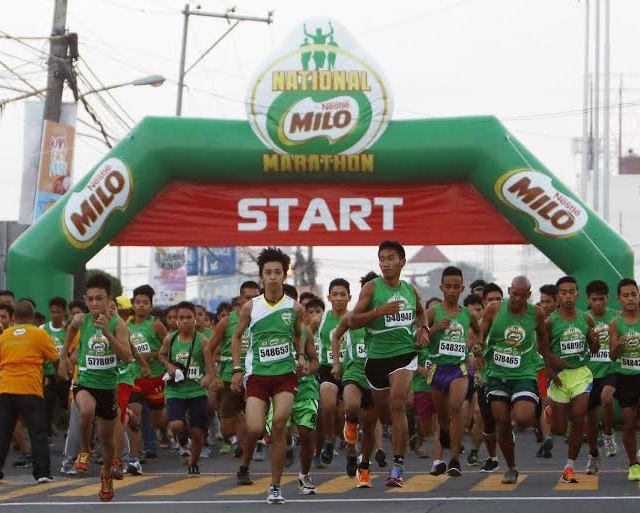 Fresh faces Alvin Nicolas, Jr. of Central Bicol State of Agriculture and Macrose Dichoso of University of the East Manila took the spotlight at the 21K centerpiece event of the 39th National MILO Marathon in Naga on Sunday. About 7,300 participants from the South conquered the streets of the city to meet the finish line. Naga City Mayor John Bongat took part in the event and sounded the gun start of the 5K race. Nicolas and Dichoso each took home the top purse of P10,000 in cash and a trophy. The 21-year-olds have also booked their slots to the National Finals in Angeles on December 6, where they will meet the nation’s elite runners in a heated grand finale to claim the MILO Marathon King and Queen titles. To provide another level of prestige to the competition and incentive for the runners, this year’s King and Queen will be sent by MILO to the USA on all-expense paid trips, for a chance to run in the prestigious 2016 Boston Marathon. Nicolas clocked in at 01:12:04, besting hundreds of runners in the men’s 21K division. Gilbert Laido (01:17:07) and Ernie Payong (01:18:05) completed the top 3 male 21K finishers. In the distaff side, Dichoso ruled with a time of 01:35:50, while in the female 21K division, Marilyn Bermundo (01:45:52) and Gemma Payong (01:46:16) finished second and third place, respectively. Red Warrior Dichoso was delighted to win her very first 21K race. The first few kilometers had not been easy for the Quezon native, but she pushed through nonetheless. “The start was pretty challenging for me, but it was a good thing I was in the lead so I kept my pace and got the hang of it by the time I got to the turning point,” she said. Like Nicolas, Dichoso has also been joining and consistently winning her races at the MILO Marathon each year, ranging from 5K to 21K running events. The race will resume in Lucena (August 30) before heading to Iloilo (September 20), Bacolod (September 27), Tagbilaran (October 4), Cebu (October 11), General Santos (October 18), Davao (November 8), Butuan (November 15), and Cagayan De Oro (November 22). The National Finals will be held on December 6 in Angeles, Pampanga.